The Orange Wednesday Foundation (OWF) was established in loving memory of Noah Jonathan Marks to help support families and individuals struggling with mental health. OWF promotes mental health awareness, supports healing through the arts, and provides grants to existing mental health programs, scholarship funds, and other related programs. Anxiety disorders are the most common mental health challenge in the US, impacting 54 percent of females and 46 percent of males. One in five children ages 13-18 have, or will have a serious mental illness; only 20 percent of them actually get help according to the National Alliance on Mental Illness. Join us for a free screening of ANGST: Raising Awareness Around Anxiety. Sunday, February 24th from 5:00 – 6:30 pm. Westmoreland Congregational United Church of Christ, 1 Westmoreland Circle, Bethesda, MD 20816. The 56 minute film explores anxiety, it’s causes, effects, and what we can do about it. Following the film, a brief Q&A with mental health professionals will be a time for discussion and reflection. 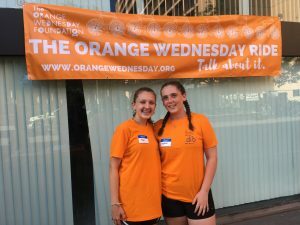 This event is sponsored by The Orange Wednesday Foundation, and Megan Fannon and Maddie Kelberg as part of their Girl Scout Silver Award Project. This is a free event provided to the community to open the conversation about mental health and anxiety. Please click here to register. He artfelt thanks to all who helped make the 2018 Orange Wednesday Ride & Event such a success: the Bike and Roll team, NAMI-Montgomery County, AFSP Maryland, Coty Novack & friends (performed spoken word scene) Dara Schweitzer (singer), Rosana Azar (our artist), Josh Quinto (DJ), those who donated food and items for the silent auction, and all who participated by buying a ticket, going on a tour, bidding on a silent auction item, and bringing a smile. We even had the support of Mother Nature, who provided great weather during a very rainy week. Proceeds from the August 1st event (over $20,000) will help increase awareness about mental health issues and fund programs to support individuals and families struggling with mental health. Please see our Facebook page for photos from the event. Sources of Strength is a universal suicide prevention program designed to build socioecological protective influences around youth and to reduce the likelihood that vulnerable youth/young adults will become suicidal. 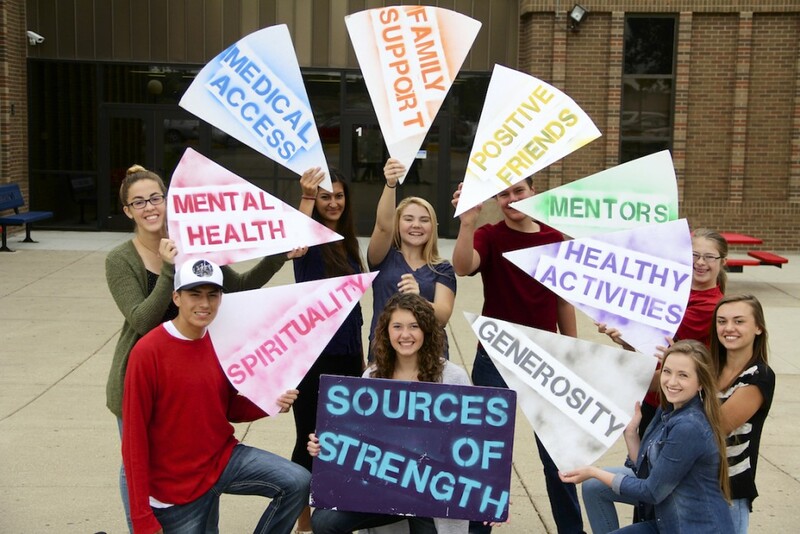 Sources of Strengt h provides the highest quality evidence-based prevention for suicide, violence, bullying and substance abuse by training, supporting, and empowering both peer leaders and caring adults to impact their world through the power of connection, hope, help and strength. 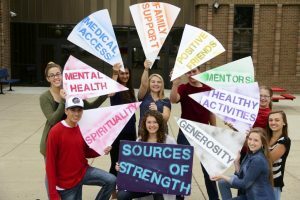 Sources of Strength is most often implemented as a school-based program in middle school, high school, or college and is also often used in community, faith-based, and cultural settings. It promotes and focuses on connectivity, school bonding, peer-adult partnerships, and help seeking behaviors. The Sources of Strength club at Walter Johnson High School recently asked students “What helps me with anger, anxiety or depression?” and documented their answers in the following video. See the WJ Sources of Strength Facebook page for more information. The mission of the Orange Wednesday Foundation is to help support families and individuals struggling with mental health. Please see our resources page for a more mental health support for families and individuals. This annual event benefits mental health programs for individuals and families and includes a bike or segway guided tour around the National Mall, refreshments, a silent auction, and more. 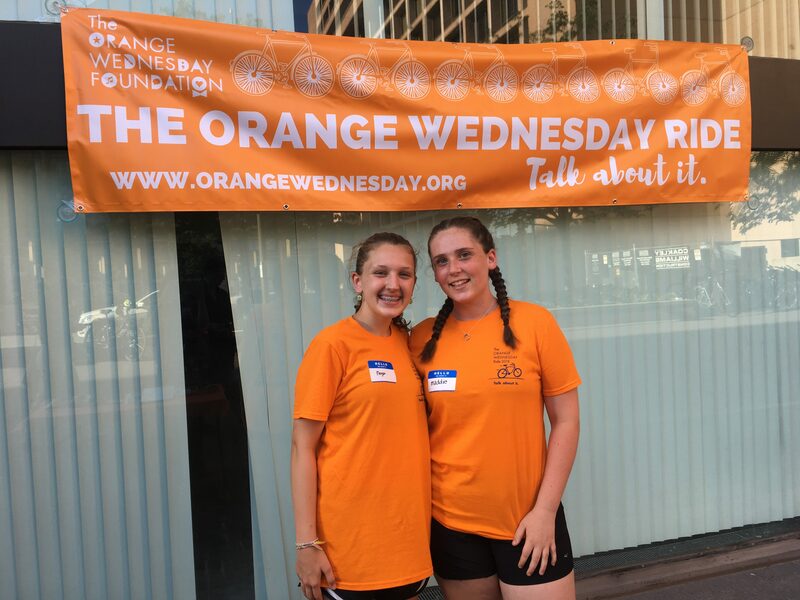 The inaugural event was held Wednesday August 17th at Bike and Roll DC and raised approximately $12,000 for the Orange Wednesday Foundation. These funds will help further the Orange Wednesday Foundation’s mission of supporting communities and growing the arts. -Grants to support existing mental health programs that incorporate the arts. Many hands and hearts contributed to the beautiful community mosaic recently installed at Walter Johnson High School. The participatory project is intended to provide healing and inspiration. The abstract design represents the artists’ love of color and movement and speaks to the creative passion and potential within all of us. To read the Montgomery County Media story about the mosaic project, click here. In May, Kavitha Cardoza of WAMU interviewed the Marks family as part of a fabulous five part series on children and mental heath – challenges and solutions. You can read or listen to the segments on the WAMU website. Thank you to all who supported the Orange Wednesday Foundation at the 0.5 K Edward Avenue Resolution Run on Jan 2, 2016, AND as part of “Team Noah” for the AFSP Walk last September. The Orange Wednesday Foundation fund was seeded from family donations and contributions made to a Noah Marks fund through Walter Johnson High school. Grants from this fund are already supporting a community art project. Additionally, in 2016 we have earmarked funds for a newly established scholarship and a grant to the Walter Johnson Reaching Out club. We are working with the American Foundation for Suicide Prevention and our local chapter of the National Alliance for Mental Illness to determine additional 2016 projects.